You can now test drive the console HD version of the Nintendo 3DS hit, Resident Evil Revelations. After giving it a thorough test drive, it's safe to say that Resident Evil fans who were burned by RE5, RE6 and Operation Raccoon City will fall in love with the franchise again as this game perfectly captures the spirit of classics like RE2 and RE4. Those who have destroyed the 3DS original may be a bit disappointed by the rather modest port. I am not saying the game is bad by any means (quite the opposite) but the HD conversion is a bit minimal compared to what Capcom promised and I don't know if the rather anemic bonus content is enough to entice someone who has logged over 50 hours on the original back for another run. Either way, it's a great game and you should download it and try it for yourself. Wii U owners who purchase Resident Evil Revelations: Unveiled Edition before June 18 (Release date is May 21) can download the "Signiture Weapons Pack" DLC for free. It contains Jill Valentine's Samurai Edge, Parker Luciani's Government and Jessica Sherawat's rapid fire G18. The three exclusive handguns will be usable in both the Campaign and Raid Mode. This is a nice bonus but a bit odd seeing as this isn't not included when it is obviously on the disc already (not surprising though considering Capcom's dodgy history with DLC). 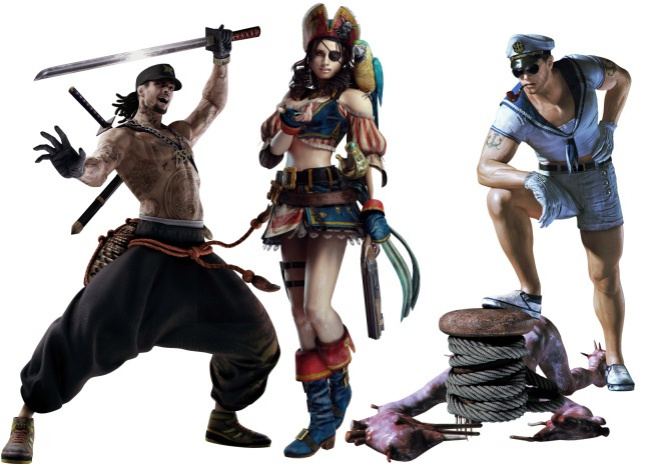 Capcom has also revealed some new bonus content in the form of 3 new outfits for Jill (Pirate), Chris (Sailor) and Keith (Ninja) which are designed to offer a bit of nautical flare to the game. Their inclusion is a bit odd and ends up feeling a little too campy but any bonus content is appreciated when you consider that Capcom would've normally charged for it. I will say that "Sailor" Chris is a bit creepy and looks like a Village People reject. What are your thoughts on this HD port? Have you played the 3DS original? Please share below.